Democracy has increased around the world since the 1970s. However it is not at all clear that this trend should be extrapolated, as the prevalence of democracy has waxed and waned in the past. Autocrats, military governments and authoritarian one-party states continue to exist. Willingness to use military force against civilians, tribalism, and geopolitical blocks enable these regimes to survive. Figure 1 shows the Varieties of Democracy Liberal Democracy score in 1975 and in 2016. The darker the color, the stronger the liberal democracy. The yellow colored countries are missing data (yellow countries in Europe in 1975 were parts of the former Soviet Union or its satellites). Democracies are more pervasive now than they were in 1975. However there continue to be many non-democratic governments and progress has been uneven in Africa and Asia. There have been several periods of waxing and waning of democracy in the last 100 years. Democracies doubled following the collapse of monarchies after World War I. However they decreased with the rise of Fascism in the 1930s, only to rebound again when new democracies were established by the Allies after World War II. Many of those newly established (post-colonial) democracies failed, however. 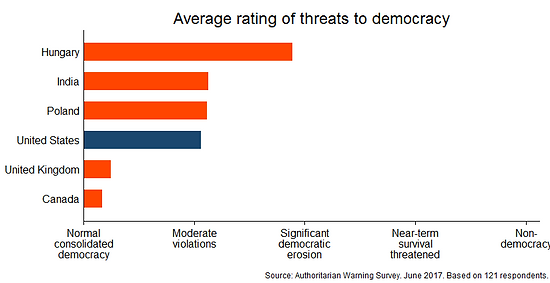 Thus democracy declined once again into the 1970s as shown in a chart by Jay Ulfelder based on a different data set. Democracies rebounded in the 1980s with the fall of the Soviet Union and its satellites. 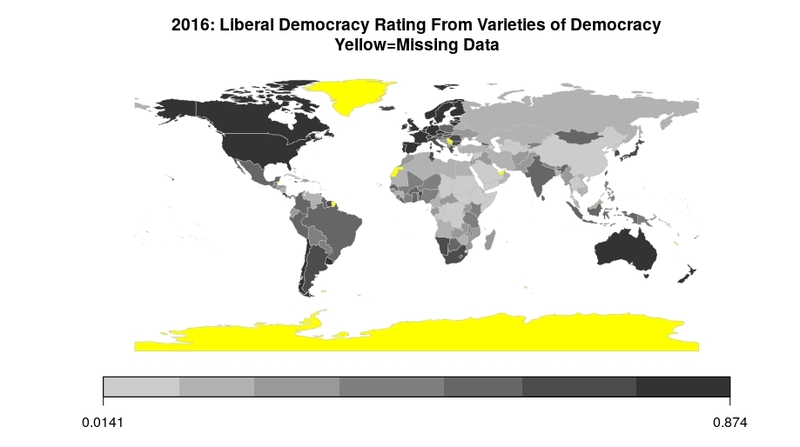 Most recently, democracies have failed or weakened in a number of countries including Venezuela, the Maldives, Ecuador, Colombia, Bolivia and Mali. Today we are witnessing autocratic rulers like Nicolas Maduro and Bashar al-Assad who have been able to stay in power by brutally suppressing their citizens through military/paramilitary means, appealing to tribal subsets of their population, and/or obtaining military support from geopolitical allies (e.g., Cuba, Russia, Iran, the U.S. etc.). New methods of resistance via social media are inexpensive and sometimes effective (e.g., The Arab Spring). However, we also have seen the limits of their effectiveness against autocrats willing to use military force. Indeed, the Castros’ five-plus decades of power are a sad example of autocratic longevity. It is easy to create theories to explain why democracies fail. One fact pattern in particular lends itself to causal theorizing: economic freedom produces faster economic growth, but faster economic growth is associated, at least initially, with growing income/wealth inequality. But attempts to apply this fact pattern specifically to failed democracies has not produced convincing confirmation that wealth inequality alone is sufficient to cause a democracy to fail. Inequality/poverty/infant mortality: New democracies that started with high levels of inequality, poverty and/or infant mortality tended to fail if they could not demonstrate they could improve the lives of ordinary citizens. Some countries with high initial poverty and inequality were nevertheless able to maintain their democracies (e.g., Guatemala) by showing progress. Democracies were especially prone to failure If benefits appeared to accrue only to a small “elite”. Failure To Supply Public Goods Both healthcare and education are examples of areas now assumed to be public goods (although not so in the 1800s). Failure to deliver them or providing them only to an “elite” group causes citizens to question whether democracy truly serves them. Education in particular plays a key role in upward mobility and in the perception of a fair opportunity for all. There is also some evidence that democracy is a learned way of life -- the longer a democracy has lasted, the more likely it is to continue. Indeed Great Britain, Australia, Canada and the United States are prime examples of long-lived continuous democracies. As to why more democracies are failing now, some commentators observe the United States is no longer able to forcefully promote democracy as effectively as it did from WW II through the fall of the Berlin Wall. US leadership has weakened for a number of reasons and non-democratic models like China and Russia have become prominent. The increasing intensity of political debate in the US over exactly the four factors identified by Kapstein and Converse is quite striking. Both mainstream and social media feature discussions of inequality, executive power (the increasing use of executive orders by both Democrats and Republicans), cultural divides (Red State/Blue State, Urban/Rural, Bi-coastal/Center, College/non-College) and public goods like healthcare and education. While the discussions can seem tiresome and interminable, Kapstein and Converse’s work suggest they are critical to the continued health of our democracy. While it may seem far-fetched, a recent poll of democracy experts points to a 10% probability that democracy could break down in the US within four years. Note the difference in Figure 3 between the United States and both the United Kingdom and Canada. While the probability of breakdown is low, 89% of respondents agreed that democracy has become weaker in the US over the last 10 years. This should serve as a serious warning not to take US democracy for granted. But voting rights excluded significant portions of the population prior to 1918 both within the United Kingdom and the US. Reasons cited for weaker US influence include an inability to establish durable democracies in Iraq and Afghanistan despite military intervention and growing isolationism of the US electorate. Transparent and reproducible: All Figures except Figure 2 from Ulfelder can be generated by using the free, publicly-available R program and the R code (with free data links) available in “democracy.r" on github. Ulfelder’s R code is linked to his Twitter feed.